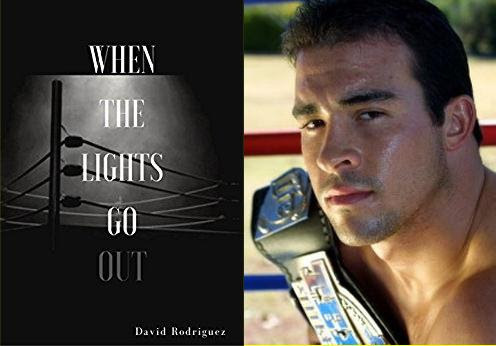 Positive reviews and media attention are pouring in for former heavyweight contender and fan favorite David “Nino” Rodriguez, on the strength of his new book, “When The Lights Go Out,” a powerful memoir of his life growing up as a fighter. Available through amazon.com, “When the Lights Go Out” is priced at $17.95 (paperback) and $7.95 (Kindle). In an inspiring tale of a bullied child growing into a fearsome warrior, El Paso, Texas-based Rodriguez, who went 35-2 as a professional including 35 KOs, winning four regional championships along the way, manages to pull at the reader’s heart strings while never shying away from the brutal realities he experienced. From street fights in Juarez, Mexico, to his beloved former trainer being murdered, to accidentally overdosing and nearly being murdered himself by street thugs, Rodriguez’s story is an unblinking eye to a life very nearly cut short at several turns. While Rodriguez’s cement fists allowed him a decorated career in boxing that is rare, what sets this story apart from other boxing tomes is his ability to convey the fears and anxieties behind his talent for violence. While watching a heavyweight slugger walk to the ring with malicious intent in his unblinking eyes, how many see a child hiding in the bathroom stall to avoid schoolyard bullies? Rodriguez bares his soul in this remarkable story, showing intelligence, wit and stunning personal insight along the way. Rodriguez hopes this story will help other fighters recognize if their careers are being mishandled the way his was. He hopes underdogs around the world will be inspired to believe in their talents and overcome their fears. He hopes those dealing with substance issues or depression will find comfort in his resurrection as an activist for several causes, and most of all, he hopes you’ll enjoy this hard-hitting autobiography by a truly remarkable sports figure. For more information visit www.davidninorodriguez.com.